Terry Tuggle has been a Texas banker for 55 years and serves as Chairman of the Board and Chief Executive Officer of First National Bank Texas (FNBT). 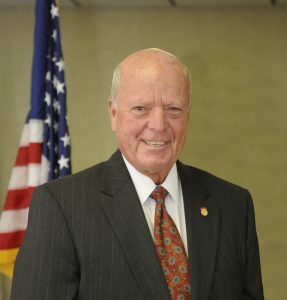 He also currently serves, and has for the past 24 years, as Chairman of the Board, Chief Executive Officer and President of Fort Hood National Bank (FHNB). Prior to his affiliation with FNBT and FHNB, Tuggle served as Chief Executive Officer of banks for two of the largest and most successful holding companies in Texas (Texas Commerce Bank and Republic Bank Texas). In 2008, the Texas Bankers Association presented Tuggle with the prestigious 50 Years in Banking Award. Raised in Odessa, Texas, Tuggle received his undergraduate degree in Business Administration from the University of Texas at Austin. He later attended the Southwest Graduate School of Banking at Southern Methodist University and the National Commercial Lending School at the University of Oklahoma and other banking schools and seminars. Tuggle works closely with the Command Staff and the Bank Liaison Office on Fort Hood seeking ways to improve products/services for the safety and well being of the soldier. He implemented the first in-store Banking Agreement with the Defense Commissary Agency and opened the first bank located in a commissary. He also negotiated with the United States Postal Service placing postal operations in each of the free-standing bank locations on Fort Hood (a banking first). Fort Hood National Bank has been the recipient of the coveted Department of Defense “Military Bank of the Year” Award ten of the last 13 years for providing exemplary service to the soldiers and families of Fort Hood. Tuggle is the recipient of the coveted Roy J. Smith Award for Outstanding Community Service and is also one of the few civilians to become a member of the exclusive Sergeant Audie Murphy Club. Tuggle received the coveted MG Anthony J. Drexel Biddle Medal Award from The Association of United States Army for his outstanding and continuous service to the U.S. Army Soldier. Terry Tuggle’s professional affiliations include: Armed Forces Financial Network (AFFN), Board of Directors; Association of Military Banks of America, Board of Directors and incoming Chairman of the Board; Association of United States Army, Board of Directors and Past President and is the immediate past State President; Killeen Economic Development Corporation, Board of Directors; Killeen Industrial Foundation, Board of Directors, past President and Charter Member; Killeen Independent School District Educational Foundation, Board of Directors; Greater Killeen Chamber of Commerce, Governmental Affairs & Local Affairs Chairman and Past President (twice); United Way, Financial Institution Chairman; Killeen/Harker Heights Rotary Club, Member – Senior Active; Committee of 12; Independent Bankers Association of Texas, Area Advisor and member of the Legislative Committee; Mounted Warfare Foundation, Charter Director; former Scott & White Hospital, Board of Visitors; former Vive Les Arts, Board of Directors and Boy Scouts of America (Longhorn Council), Advisor and various other Boy Scout roles. Tuggle is the recipient of the Silver Eagle Award for his continuous community service. He has served on numerous committees and civic activities. Terry’s wife Joyce is a native of Texas. They have two sons who also reside in Texas.